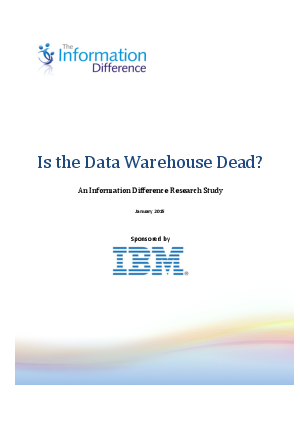 Home > IBM > Is the Data Warehouse dead? Big Data has generated much interest and attention in the media of late. Indeed, several authors have recently raised the question of whether Big Data approaches, such as Hadoop, will pronounce the death sentence on the conventional data warehouse. In this survey we investigate the current state of the data warehouse and examine its recent challenger in the form of Big Data solutions as an alternative. Is the new technology really complementary or is the reign of the data warehouse nearing an end?